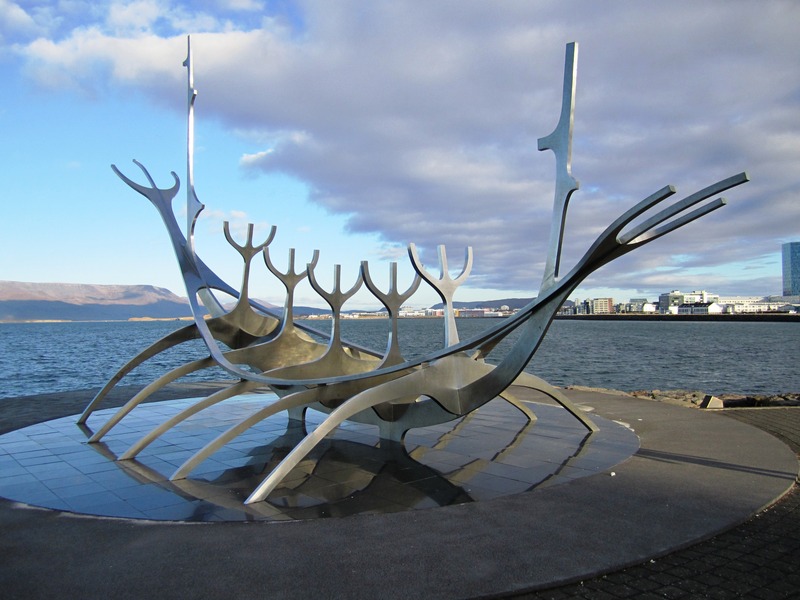 Reykjavik Iceland encompasses the best of both worlds; a sophisticated urban destination complete with luxury spas, world class dining and a lively club scene, tempered with outdoor adventures like glacier hiking, geothermal spas, and whale watching. A trip to Reykjavik would not be complete without a visit to one or all of these top attractions. Start the vacation right with a trip to the world famous Blue Lagoon; a luxury outdoor geothermal spa located near the airport. Buses are conveniently stationed at the airport to transport passengers straight to the Blue Lagoon. The enormous locker rooms are equipped with large sized lockers, locks, blow dryers and towels for guests. Spa-goers can recharge after a long flight by floating around in the six million liters of warm geothermal seawater that fill the lagoon. Silica mud masks are provided in boxes around the lagoon to apply to ones face and skin. Visitors can spend an hour or a day and afterwards the bus will drop them off at their final destination. Iceland’s landscape is literally defined by volcanoes. This tiny island is a volcanic hot spot because of its position over the mid-Atlantic ridge; the spot where the Eurasian and North American plates are separating. Tours are available to visit Eyafjallajökull; the volcano that made global headlines when it recently erupted shutting down air traffic in Europe for weeks. Although it is not currently erupting, tours are available to view the aftermath. Most tours can be combined with a dog sled or snowmobile adventure on the neighboring sub-glacial volcano named Katla, located on Myrdalsjökull glacier. The usual mode of transportion in Iceland is super jeep 4 x 4, these monster trucks are needed to navigate the icy road conditions leading up to the glaciers. The Golden Circle tour consists of the three pinnacles of Icelandic tourism; Geysir, Gullfoss, and Thingvellir National park. The first stop on this eight hour tour is to view Geysir; a massive blow hole so big it’s rumored that all other geysers in the world have been named after it. 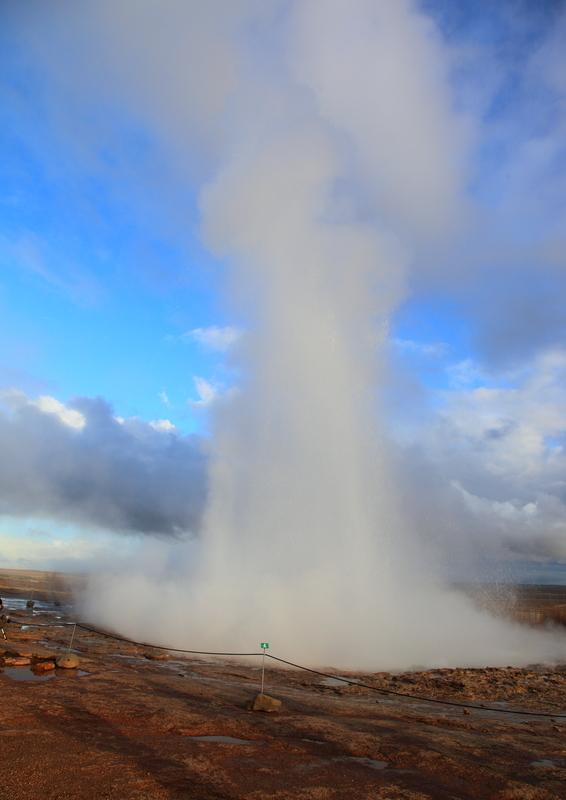 Although Geysir doesn’t spout regularly, nearby Strokkur faithfully erupts every few minutes shooting a giant stream of water 30 meters into the air. The next stop is the famous double- layered falls of Gullfoss. Visitors can walk along the scenic trail leading to the 32 meter high cascades. The tour ends with a trip to the beautiful Thingvellir National park. The historic location of Alpingi or the national parliament of the first settlers of Iceland is housed in the park, as well as the location of the only spot in the world that the rift between the continents is clearly visible. The Kolaportid flea market is a popular shopping destination for locals as well as tourists. Open only on the weekends, the market is housed in an industrial-style warehouse at Tryggvagötu 19 in the Old Harbor. Shoppers can browse through a wide variety of books, clothes, knick-knacks and other fun items. The flea market is a great place to sample traditional Icelandic delicacies such as Hákarl; chunks of fermented shark meat. The shark meat is prepared by burying it underground for up to six months to remove the toxins so that it is safe to eat. It’s traditionally washed down with a shot of Black Death or Brennivín; an alcoholic beverage similar to snapps, made from fermented potato pulp, and flavored with caraway seeds. Visitors can purchase Hákarl and other delicacies such as dried fish, lamb pate, or horse meat sausages from the food section of the flea market. Taking advantage of the longer daylight hours during summer solstice, the party starts around midnight and lasts well into the morning. Most of the clubs and bars are located on the main strip in the city center and stay open late. Afterwards, follow the hoards of hungry partygoers for an Icelandic hotdog, customary after a long night of drinking. The Perlan is a fun destination for a few hours or an entire afternoon. It’s reflective blue dome sits on top of six gigantic circular water tanks that hold the city’s water supply. Sitting on a hill high above the city, the Perlan’s viewing deck offers the best panoramic view of Reykjavik and the surrounding area. The top floor is home to one of Reykjavik’s best restaurant; a revolving fine dining restaurant that boasts the best city vistas. The second floor houses a cafeteria style restaurant that serves great food, desserts and coffee. The Saga museum is located on the ground floor where Icelandic history is recreated daily for visitors. The Perlan is surrounded by beautiful gardens, walking trails, and an artificial geyser. The Puffin is an adorable little orange beaked bird that can be spotted off the coast of Reykjavik. For a close up view of the flocks, take a fun puffin watching tour through Elding; the leading provider of whale and puffin watching tours. Visitors may get lucky and even spot a whale! During the months of April to October, Orca whales, Minke whales, Humpback, porpoises and dolphins are typically seen in the surrounding waters of the harbor. 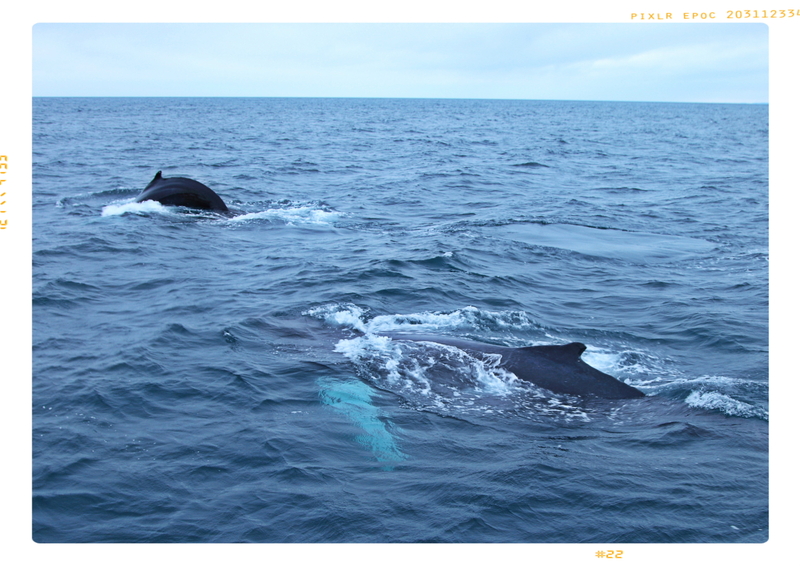 For a longer excursion take a whale watching tour. Whale and puffin watching tours both depart multiple times daily from Reykjavik harbor. Elding even supplies warm red and blue jumpsuits to keep their passengers warm as it tends to get cold and windy once out of the confines of the harbor. A visit to anyone of these top attractions will give visitors a sense of the essential spirit of Iceland. This charming European city with its trendy shops, wild nightlife and fun adventure tours will stand out in any visitors mind as the trip of a lifetime. This entry was posted in Arctic and tagged Þingvellir, Geysir, Gullfoss, Hákarl, iceland, Mid-Atlantic Ridge, reykjavik. Bookmark the permalink. Pingback: Granny’s Gone CouchSurfing… to Iceland | London Life: rants, politics, family, arts and travels..